The cities and towns of Europe often have a particular devotion to Our Lady. Through the ages she manifested herself under a particular title and expressed her desire to be invoked under a different name. A shrine with that particular image would become a pilgrimage site as Our Lady worked miracles for the people of the vicinity. 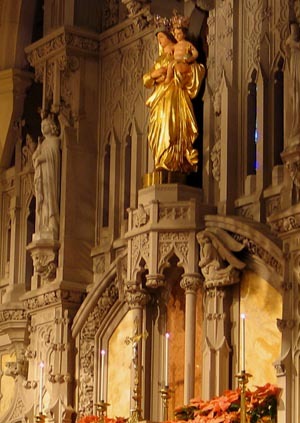 In the United States, we have fewer such marvels, and unfortunately the small number of miraculous statues that exist is not widely known, even among Catholics. A unique title and devotion that Our Lady chose for our country – certainly deserving of more recognition – is that of Our Lady of Prompt Succor, patroness of the city of New Orleans and the State of Louisiana. A Mass in her honor is said every January 8 to commemorate a great miracle she worked on behalf of the city in the Battle of New Orleans of 1815. On that occasion, the Ursuline sisters made a vow to Our Lady of Prompt Succor to have a solemn high Mass offered each year on January 8 if she would give victory to the vastly outnumbered American forces. The favor was granted, and for the past 195 years without exception the promised Mass has been celebrated in gratitude for Our Lady’s intercession in that critical battle. How Our Lady chose to come to Louisiana under this new title is one story. Her miraculous intervention in the Battle of New Orleans in 1815 is another. Both deserve to be told and retold. With the outbreak of the French Revolution in 1792, all the religious in that country were forced to leave their convents. 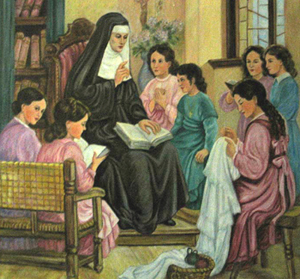 When the revolutionary fury abated a bit, Mother St. Michel, an Ursuline nun, gathered a small group of the scattered sisters and opened a boarding school in the city of Montpellier in Provence, south France. Across the ocean, the situation was also unsettled. Louisiana, a French colony that had been ceded by France to Spain 50 years earlier, had been restored to France, who sold it to the United States as part of the Louisiana Purchase. Fearing that violence could break out with these changes, 16 members of the Ursuline Convent in New Orleans went to Cuba, leaving only 7 sisters to keep their orphanages and schools. The convent would have to close. An appeal for help was sent to Mother St. Michel in France, who felt impelled to come to the assistance of her Ursuline sisters in Louisiana. The obstacles, however, seemed insurmountable. 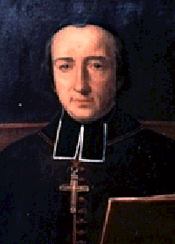 Her spiritual adviser referred the matter to Bishop Fournier of Montpelier, who thought that France needed that valiant religious more than Louisiana did. He told her, "The Pope alone can give this authorization." "O Most Holy Virgin Mary, if you obtain a prompt and favorable answer to my letter, I promise to have you honored in New Orleans under the title of Our Lady of Prompt Succor." Almost immediately a way opened to send the letter. The missive left Montpellier for Rome on March 19, 1809 and the answer was dated Rome, April 29, 1809 – an exceedingly prompt reply in those days. What seemed impossible was achieved. The Pope’s answer was not only prompt, but favorable. Against all opposition, he gave his full approval and an apostolic blessing to her and those who would help in her mission. It only remained for Mother St. Michel to accomplish her part of the wonderful contract. 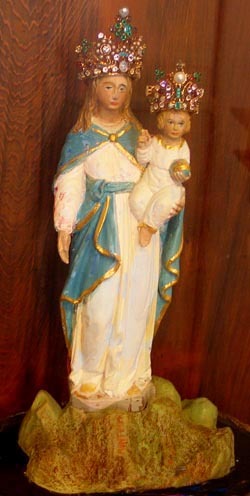 She set out at once to fulfill her duty by ordering a noble statue of the Holy Mother of God to be sculpted. In her arms Our Lady held the Divine Child, in whose hand was a globe. The Bishop of Montpellier, convinced now of the desire of the Blessed Virgin to be honored under the title of Our Lady of Prompt Succor on the far-away shores of Louisiana, blessed the statue and set it on its way with a small brave band of Ursulines. Mother St. Michel and her companions reached New Orleans on December 31, 1810. At once the cherished statue was installed in the Convent Chapel. Immediately Our Lady began to show her goodness and willingness to offer succor to her American children. "Under this title the Most Blessed Virgin has so often manifested her power and goodness that the religious have unbounded confidence in her," read the early Convent chronicles. Instantly the wind changed and the Convent was out of danger. The Ursuline Convent was one of the few buildings in the French Quarter spared from destruction. Seeing the inexplicable occurrence, witnesses cried out, "Our Lady of Prompt Succor has saved us!" From the prayer of Mother St. Michel came the invocation: Our Lady of Prompt Succor, hasten to help us! The extraordinary victory of New Orleans won by American arms will forever be attributed by Catholics to Our Lady of Prompt Succor. The rescue of Our Lady came at a moment when a great and imminent danger was threatening the city. 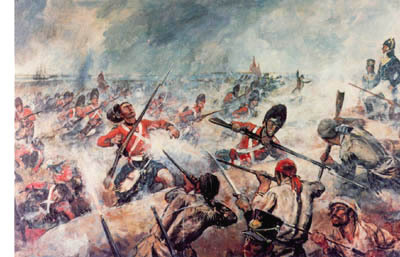 The Battle of New Orleans on January 8, 1815, was the last major confrontation of the War of 1812. The Napoleonic Wars were ended, and England had sent its forces to America to protect its Canadian provinces and to wrest from the U.S. the Mississippi Valley. New Orleans was the gateway of the great Valley and must fall first. For this purpose, the British boasted a force of 15,000 men commanded by seasoned officers and a fleet of 50 ships carrying a thousand guns. On the American side, the unseasoned General Andrew Jackson had 6,000 ragged, half-armed defenders of an unprepared city without supplies or arms. So certain were the British of victory that on board a ship accompanying the fleet were the future staff of civil officials sent to administer the conquered province. From a human standpoint, there was little hope of success. 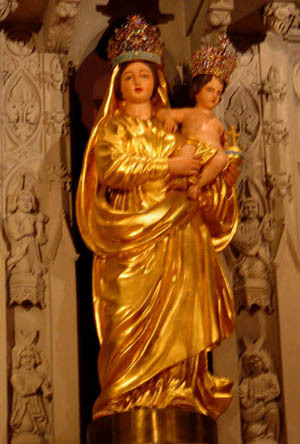 Facing this crisis, Bishop William Dubourg urged all in the city to have recourse to Our Lady to come to their prompt succor. On the night before the battle, the faithful gathered at the Chapel with the Ursuline nuns to implore Our Lady’s intercession. She did not fail them. On the morning of January 8, Bishop Dubourg offered Mass at the altar on which the statue of Our Lady of Prompt Succor had been placed. The Prioress of the Convent made a vow that a Mass of Thanksgiving would be solemnly celebrated each year should the Americans triumph. At the moment of Communion, a courier ran into the Chapel to inform all those present that, against all odds, the British had been defeated. What had happened in the battle field? As the fog lifted on the morning of January 8, the main body of the British force advanced to the attack. Met by steady fire from the American lines, they inexplicably fell into confusion. Then followed disorder, slaughter and rout of such a nature and magnitude that natural explanations alone cannot account for the disaster. In a mere 25 minutes the battle was over. Over 2,500 of the British were dead, wounded or prisoners on the field, falling like blades of grass beneath the scythe of a powerful mower. The American losses did not exceed 13 – seven killed and six wounded. The victory Our Lady gave could not have been more prompt or more complete. The favor of Heaven did not escape the eye of General Jackson. Throughout his life he would remark that the battle was won only with the aid of a supernatural presence. After the battle, he went to the Ursuline Convent himself to thank the sisters for the prayers they had offered for the success of his campaign. Then he addressed a letter to Bishop Dubourg, entreating that an act of public thanksgiving be performed in the Cathedral in token of the “signal interposition from Heaven” and “our humble sense of it.” The letter puts beyond question Jackson’s conviction and testimony that the victory was due to a supernatural cause. A constant stream of benefits continued to stream from the hands of Our Lady favoring those who came to her asking prompt succor. In 1851 Rome officially approved the devotion. In 1894 Pope Leo XIII indulgenced the Confraternity and three years later raised it to an Archconfraternity. 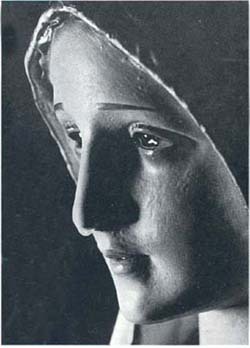 Our Lady of Prompt Succor was crowned by the papal delegate in 1895 – the first such coronation ceremony in our country. In 1928 the shrine of Our Lady of Prompt Succor was relocated to the current Ursuline Academy, and she was named patroness of New Orleans and Louisiana. The official feast was set for January 15, although the Mass of January 8, the day of the miraculous assistance given to our troops, continues to be solemnly offered. It also fulfills the first promise of Mother St. Michel who brought this blessed devotion and statue from Montpellier to New Orleans. Second, Our Lady chose to come to New Orleans, a city privileged by Heaven with marked favors. When the people are faithful, Our Lady responds with signal gifts and graces. When they are not, she warns them with her tears and chastises them with natural disasters. During hurricane season, prayers are said at every Mass in the city requesting Our Lady of Prompt Succor's intercession and protection. Although the Old Convent and chapel sustained damage when Hurricane Katrina struck in August 2005, the buildings were not destroyed, and repairs were hastily made. For the vigilant Catholic, Katrina can be seen as a merciful warning from a concerned Mother of the coming chastisement for an unrepentant city and world. Her message also seems clear: She is telling us to follow her admonitions and remain close to her and her Son so that she might protect us and give her succor in the days to come. O Almighty and Eternal God, Who sees us surrounded by so many dangers and miseries, grant in Thy infinite goodness that the Blessed Virgin Mary, Mother of Thy Divine Son, may defend us from the evil spirit, protect us against all adversities, obtain for us (here ask for the particular favor you desire), and safely guide us to the Kingdom of Heaven. This we ask of thee through Our Lord Jesus Christ, Thy Son, Who lives and reigns with Thee in the unity of the Holy Spirit, one God, forever. Amen. O Mary, Mother of God, amid the tribulations of the world, watch over the people of God and be to us truly Our Lady of Prompt Succor. Make haste to help us in all our necessities, that in this fleeting life thou may be our succor. Obtain for us (here mention the particular favor you desire). Help us to gain life everlasting through the merits of Jesus, thy Son, Our Lord and Redeemer. Amen. V. Our Lady of Prompt Succor, pray for us. O Mary, Mother of God, who amid the tribulations of the world, watches over us and over the Church of Thy Son, be to us and to the Church, truly, Our Lady of Prompt Succor. Make haste to help us in all our necessities, that in this fleeting life Thou mayest be our succor, and obtain for us (here ask the particular favor you desire). Help us to gain life everlasting through the merits of Jesus, Thy Son, Our Lord and Redeemer. Amen.